Up your décor game this weekend with easy photo print displays you can DIY from start to finish – all in 48 hours! Grab your favourite prints, a few supplies from your local craft store, and let’s get started. Give your coffee table some love with decorative coasters made with 4×4″ square prints. 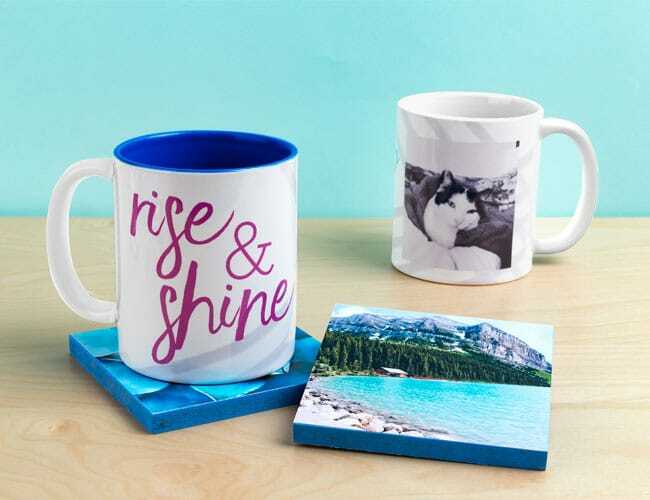 Tip: Give a set of photo coasters and personalised Snapfish mugs as a gift! 1. Order your 4×4″ print using the Snapfish app, or cut a 6×4″ print into a 4×4″ shape. 2. Paint edges of a 4×4″ wood block and let dry. Repeat with a second coat if needed. 3. Cover back of 4×4″ square print with decoupage and adhere to the top of your wood block. 4. Decoupage a thin coat on the entire block, including the photo. 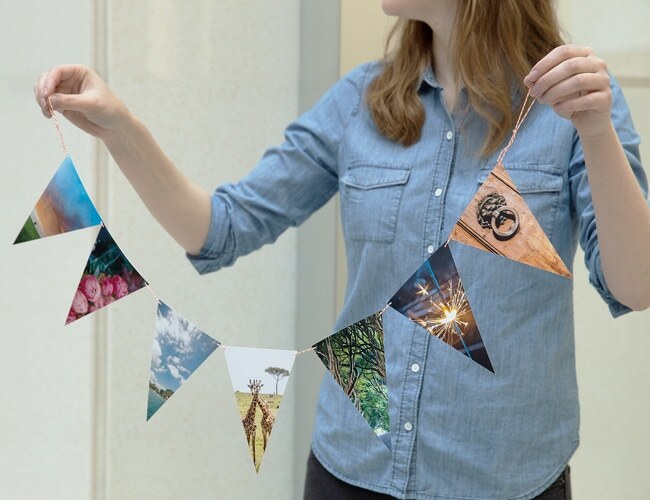 Don’t worry – the decoupage will dry clear and your photo will shine through. 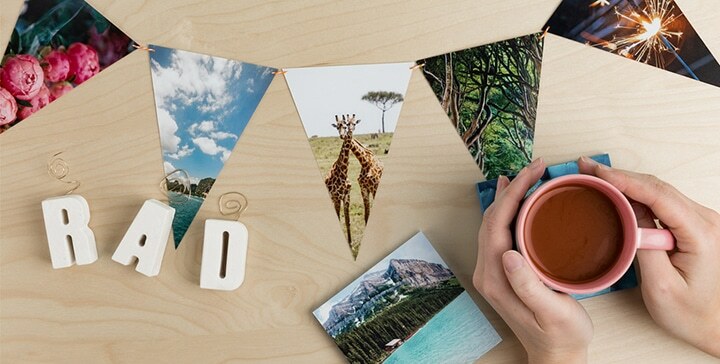 Perfect for both celebrations and everyday décor, a photo banner is a simple, budget-friendly way to add personality to your space. Tip: Choose portrait-oriented 6×4″ prints with the subject in the middle of the photo so you don’t crop it out when slicing triangles. 1. Find the midpoint of each 6×4″ photo by measuring the short side with a ruler. Mark with a pencil. 3. Punch two small holes at the top of each new triangle (you can find mini hole punchers at your local craft store), and thread together with twine. 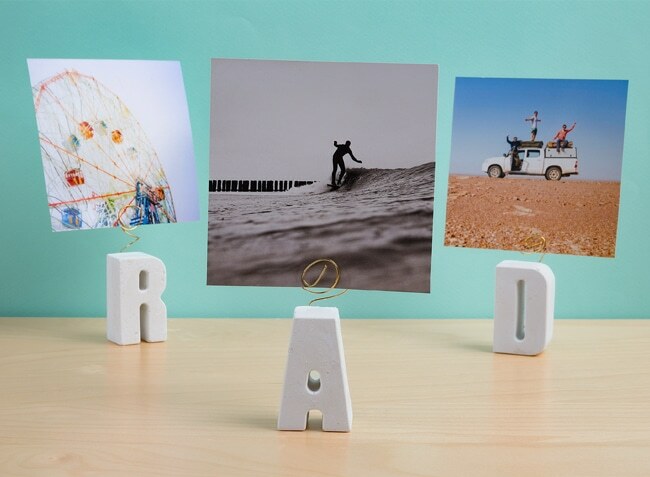 Beautify your workspace with these mini photo displays and 4×4″ prints from Snapfish. Tip: We were inspired by I Spy DIY’s cement letter holders, check out the how-to on her blog! 3. Allow to dry overnight, then gently pop out letter. Display on desk and insert 4×4″ square photo! Ready for a DIY-filled weekend? Start printing your favourite photos with Snapfish! Tagged as DIY, photo displays, prints.